or simply creating the signature in the email body and then copying its code to the Thunderbird settings. Follow the steps below to learn more about all three methods. Click on your email account name e.g. maryluck@company.com and then on View settings for this account option under the Accounts section. In the Account settings window go to the Signature text section. In order to use HTML code you need to check the Use HTML box. 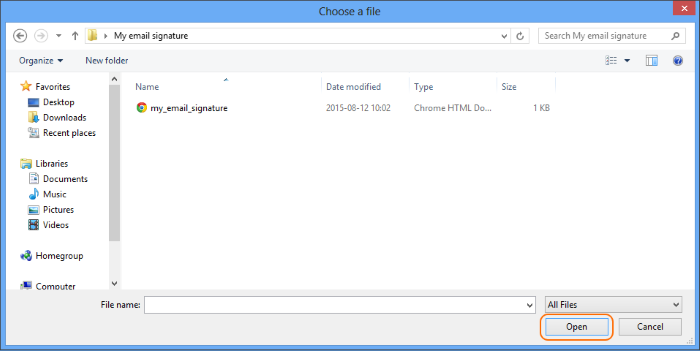 Now you can create a signature directly in the Signature text field by typing in HTML code. 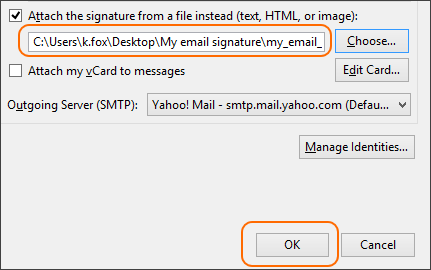 When the HTML code of your signature is ready, click OK.
Now, go to the main view of Thunderbird and click Write to create a new email message. Your new email signature should be already there. In order to follow these steps, you need to create a file containing your email signature. 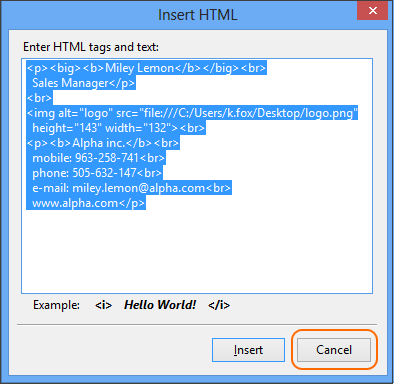 The file can be HTML, text or image type. If you do not have one or do not want to prepare the file by yourself, you can download one of our ready-made signature templates. When the file is ready, follow the steps below to insert it into the Thunderbird email client. Go to Account Settings. You can access them as described in step 2 of previous method or open Thunderbird menu, then click Options and Account Settings. Check the Attach the signature from a file instead (text, HTML, or image) box and then select a file containing your email signature by clicking the Choose… button. Select the HTML file with your email signature and click the Open button to insert it into your account. Once the file has been attached, click OK. Your signature should be already available in every new email message. To check that, go to the main view of Thunderbird and click the Write button to see the result. Go to the top menu and open a new message by clicking the Write button. 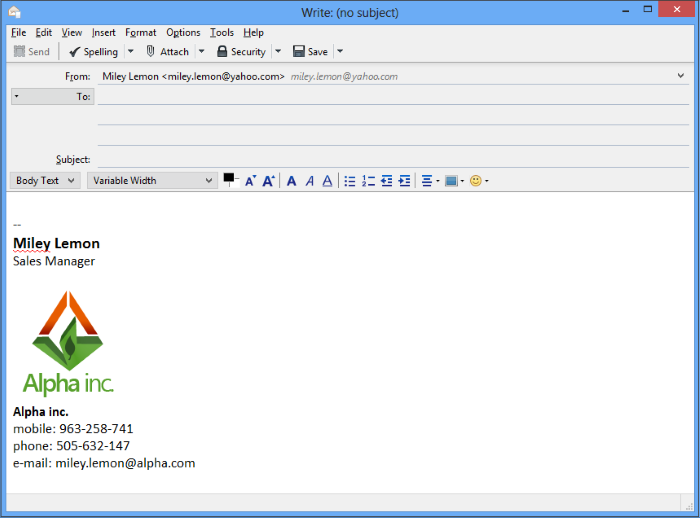 In the new message window, you can compose your email signature using a basic toolbar or, to adjust it to your needs, you can use available formatting options under the Insert and Format tabs as well. 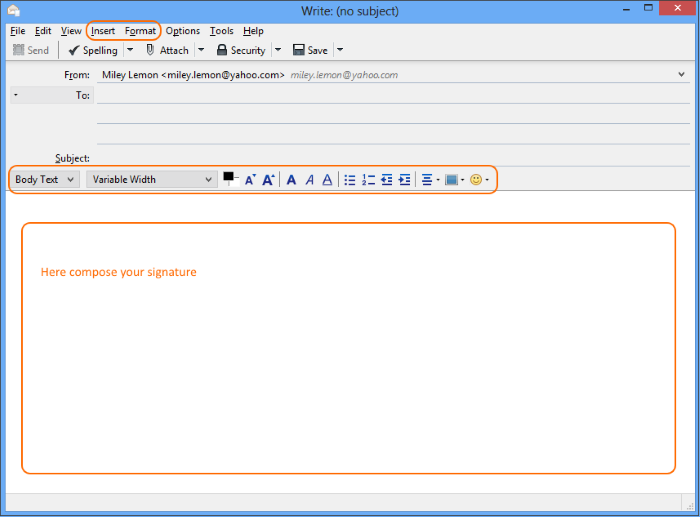 Once the signature is composed, select all in the email body. You can do that by pressing the combination of Crtl+A on the keyboard or going to the Edit tab and then clicking the Select All option. Once the whole signature has been selected, go to the Insert tab and then click the HTML… option. In a new pop-up window, you should see your signature in form of HTML code. Copy this text and click Cancel as we do not want it to be inserted at this moment. Now go to the Account settings. (to see a more detailed instruction on how to access them, please refer to step 2 in the previous method). In the Account settings window, you need to paste the copied HTML code into the Signature text section. Please make sure that the Use HTML box is checked. Note: Instead of composing your email signature in the email body, you can use this email signature generator, which really simplifies the process. When you have finished creating the signature, copy the HTML code from the signature generator and paste it into the Signature text section in Thunderbird. 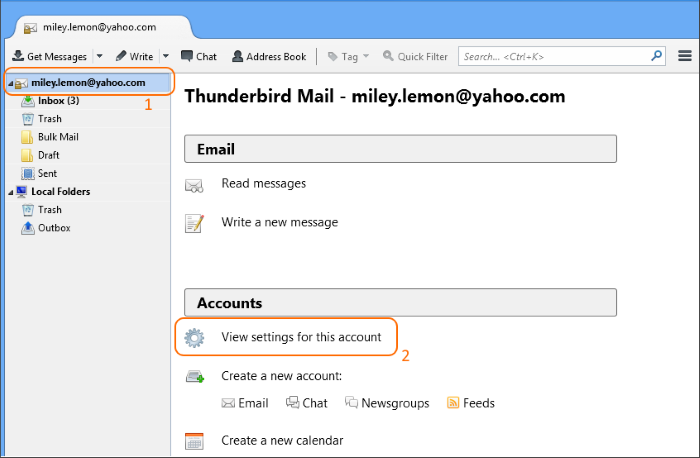 Go to the main Thunderbird view and click the Write option to open a new message. Your email signature will be there. From now on, you do not need to worry about creating a good-looking signature every time you want to send an email as your email signature is already inserted into the message body. Images in email signatures – linked or embedded? This entry was posted in Tips and tagged email signature, thunderbird on August 19, 2015 by Milena Szyrwiel. I have followed these very good directions (option 3) and when I am finished and click OK, a window appears that says : An account with this name already exists. Please enter a different account name. Please help! I only have one account! My research shows that the problem might be related to an updated version of Thunderbird. Please refer to this Thunderbird forum where the problem is discussed in detail: http://forums.mozillazine.org/viewtopic.php?f=39&t=2867903. As stated in that thread, a rollback to, e.g. 24.6.0 version of Thunderbird may solve the problem. Please let me know whether it helped! I am having that same problem. How do I do a “rollback”? Follow the steps from this article to go back to an old version of Thunderbird: http://kb.mozillazine.org/Go_back_to_an_old_version_of_Thunderbird. Before doing the re-installation, create a backup copy of your Thunderbird profile: http://kb.mozillazine.org/Profile_backup (test your backup copy to make sure it is not corrupted and works as expected). Thanks for this info – very useful. Using method 3, what’s the best way to insert a graphic link to social media? And … how do you stop the links “turning blue”? And … any advice re. using special characters? I have an é in my name and I see this is often changed to Ã©. Thanks! The problem with displaying special characters may be caused by the set of fonts installed on your operating system which may not support special characters or by inadequate character encoding. For more info, please refer to this article: http://kb.mozillazine.org/International_characters. To change the color of hyperlinks, go to the Thunderbird settings and then expand Options>Options>Display>Formatting tab. Under the Formatting tab in the Fonts & Colors section, click the Colors button. In the resulting widow, select new colors for your links. 2. Open a new message. 3. In the new message window, go to the Insert tab in the top menu (or to the Insert icon in the message body) and click the Image… option. 4. In the resulting window, click Choose File to insert the image (your social media icon) and then, in the same window, go to the Link tab where you can enter a link of your choice. Click OK to save changes. 5. Now, when you click on your social media icon, it should take you to the selected webpage. 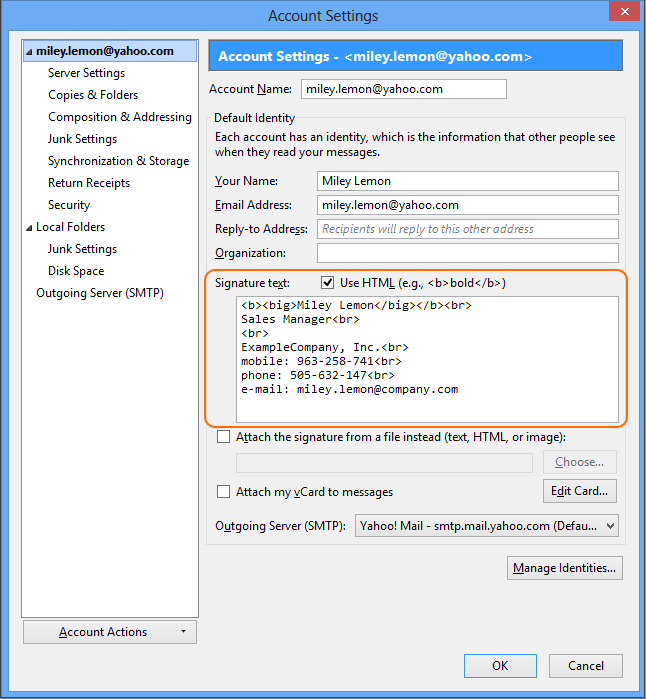 How would one insert a hyperlink to your signature within Thunderbird? Do you need to attach a file? I’m trying “Command K” and that does not seem to work (as it does in Apple Mail). Thanks for the helpful article. 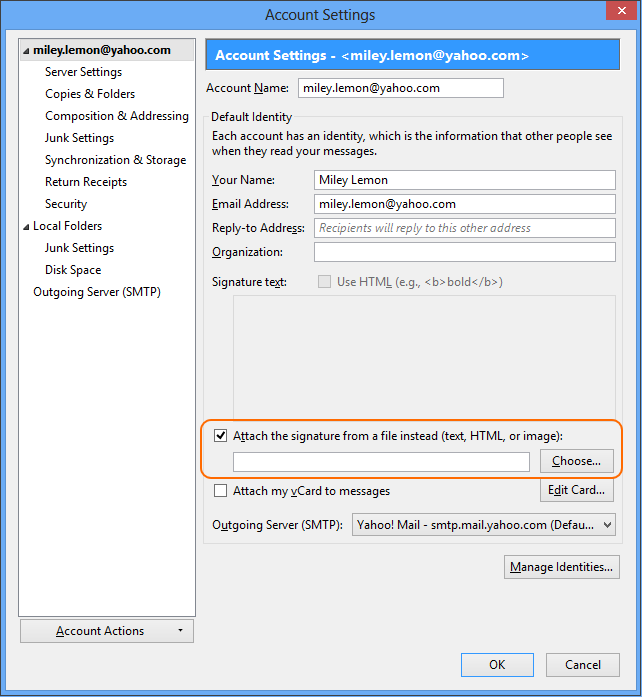 – In method 3, while composing your signature in the email body, insert a link using the “Ctrl/Cmd + L” command or go to the Insert tab and then select the Link option. Thanks for explaining clearly Milena. I like method 3. My signature will consist of 3 or 4 simple lines. However I would like to add a JPEG just left balancing between the lines. If you know would you explain how I can do this with the 3rd method? If I understood you correctly, simply position the cursor between the lines in your signature exactly where the JPEG should appear (use the Enter key if you need to add an extra line to the signature), then go to the Insert tab, and select Image (method 3, step 3). In the resulting window, under the Location tab, click Choose File to load an image and click OK.
Let me know whether it helps! how do i get rid of the — before the signature? To get rid of the double dash “– ” before the signature, you need to do some changes in the config editor as per this instruction: http://kb.mozillazine.org/Signatures_(Thunderbird)#Removing_the_signature_separator (section: Removing the signature separator). I have done everything I’ve read but when I go to a new email it looks like I have a blank signature then below it has the new signature I created. How do I get rid of this blank signature. Perhaps there are some extra lines of code added at the beginning of your signature, which cause the problem (they might have been added by the program for some reason). Please try to recreate your signature from scratch using Method 1 as shown in this article. 1. Create a new text file (right-click the mouse button>New>Text Document) and name it, e.g. TB Signature. 2. Open the text file and create your signature. Save changes and close the file. 3. Go to Thunderbird and import the file using Method 2 from this article. 4. Open a new message to check the results. This functionality is not supported natively. 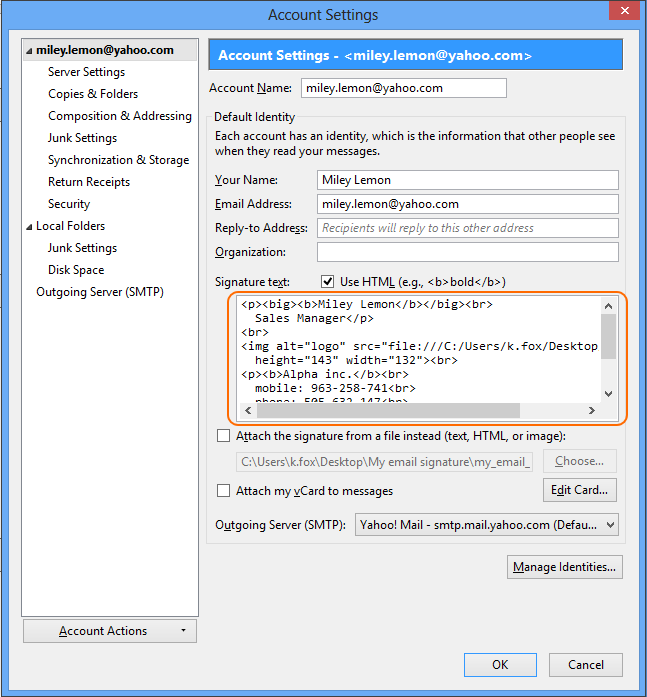 To insert email signatures right under replies/forwards, you would need to use a third party tool like CodeTwo Exchange Rules: https://www.codetwo.com/exchange-rules-family/?sts=5255 (providing you use an Exchange email account in Thunderbird). I have done the method 3 and created the signature. But when I am sending mail from (or via) Thunderbird and looking up it directly in gmail, it shows a different font other than I have set. Thunderbird shows the same signature I have set. I have tested this with different browsers and fonts, but I was not able to reproduce the problem – my signature looked exactly as I set it up in Thunderbird. What font are you using when the problem occurs? Also, have you tried to recreate your signature from scratch or use different fonts? very useful and nice article . Thank you so much.. I am trying to use Method 2 since my office has a logo. Several times I have created a new file with the signature material. But every time I test to write a new E-mail, the signature appears as merely a double hyphen — at the left margin, and the letters PK double spaced below, also at the left margin. I can’t get the signature line to reproduce at all. Please help. Thank you. If method 2 is not working for you, please try method 3. In the editor, you can add the logo by clicking the image icon in the editor, or using the menu (Insert>Image…). If you still experience problems, just use one of our free templates or the Signature Generator (both links on the menu) and simply substitute graphics with your own. Please let me know if it solved your problem. Thank you Kamil. I tried method 3 and it worked. Only problem is that there remains a stubborn double hyphen — at the left margin and above my signature, and I can’t get rid of the double hyphen. I tried using the Signature Generator template, went into Gmail, and my signature was set up just as I want it, except with the double hyphen. I tried everything from the beinning, even re-formatted the signature template, and I still can’t get rid of the double hyphen. Please help again. Thanks. I am glad the method worked and I think you will deal with the double hyphen as easily. Go to Tools>Options>Edit>Preferences>Advanced>Config Editor and find the entry mail.identity.default.suppress_signature_separator (you can use filter suppress_signature_separator) and double click it so that it is set to true (or 1). Thank you for your help. I could not get beyond Tools>Options. Edit, Preferences etc. were nowhere to be found. However, the double hyphens — have disappeared on their own. I tested my E-mail by writing to myself, and now it is clean, with no distractions. I appreciate your assistance, Kamil. Hi, when i follow either option i get red lines around the boxes and the format doesnt look the same as it does via IE/Chrome, and when i try to still send emails using it I get error messages saying there are issues with each png image that’s used within it. I cant figure out how to resolve this. Any help would be greatly appreciated. Red borders are visible only in your editor to help you see where your tables are, they should not appear in your signature. Please send a message to yourself (when you are able) to test if they are visible in messages. When it comes to formatting issues and png problems, I need more information to help you. What are the differences between the formatting on browsers and in Thunderbird? Finally, could you specify how you insert images and what the error message is? When i reply to mail my signature always go at the bottom part of the email trail. Please go to Tools>Account Settings>[account name]>Composition & Addressing and try setting the reply style to Start my reply above the quote and setting place my signature to below my reply (above the quote). Thanks a lot, that was really helpful. Thanks. Found this easier to use than T-bird’s own doc. Currently, when I reply an email, the location of my signature is right at the bottom of the thread. Meaning if I reply several times, my signature will appear several times at the bottom of the thread. How do i have my signature at the end of my reply every time i reply? This is a common problem, to solve it in Thunderbird, please go to Tools>Account Settings>[account name]>Composition & Addressing and set the reply style to Start my reply above the quote and then configure place my signature option to below my reply (above the quote). i like to insert my company logo in my signature with method 1 , i think it s missing… could you help? Thank s! You can insert your company logo with method 1 using standard HTML code, that is <img src=”your image file path” />. You can see the code in step 8 of method 3. If you have any problems, please try using method 3, as it is the quickest and requires no HTML skill. I used option 3 and it worked really well. However I now wish to amend it slightly – I wish to change the link associated with one of the images in my signature. Do I need to make a new signature or can I amend/edit? You can edit the signature. Changing the link should be very easy. Simply go to your signature settings (Step 8 in the third method), find the link you want to change, and change it to the new one. Make sure that the link is surrounded by quotation marks and click OK save the changes. When you insert the image using Insert > Image, please make sure that the Attach this image to the message option is checked. If it still does not work, you can try uploading your picture to an image hosting service and pasting the picture’s url into the HTML code in place of the image path. I’ve checked the ‘Attach this image to the message’ is checked so in theory all should work but it isn’t. I’ll try your other suggestion at a later date. I was able to set up the signature, however, when I reply to the message, my signature goes to the end of email from the recipient, instead above it. I want my signature at the end of my email, not at the end of email thread. Is there any way to fix it? Thanks a lot! Please try this solution: go to Tools>Account Settings>[account name]>Composition & Addressing and set the reply style to Start my reply above the quote and then, change the place my signature setting to below my reply (above the quote). Wow, this is great. Thank you so much for your help!!!! This was superduper helpful – a lot more than anything else I’ve encountered (including the official thunderbird support). The most reliable image formats are PNG and JPG. Please try using one of those. PNG & JPG are most acceptable image format in digital world. You may use your e-mail signature banner file as .PNG or .JPG. 1. Open a fresh/new e-mail space. 2. 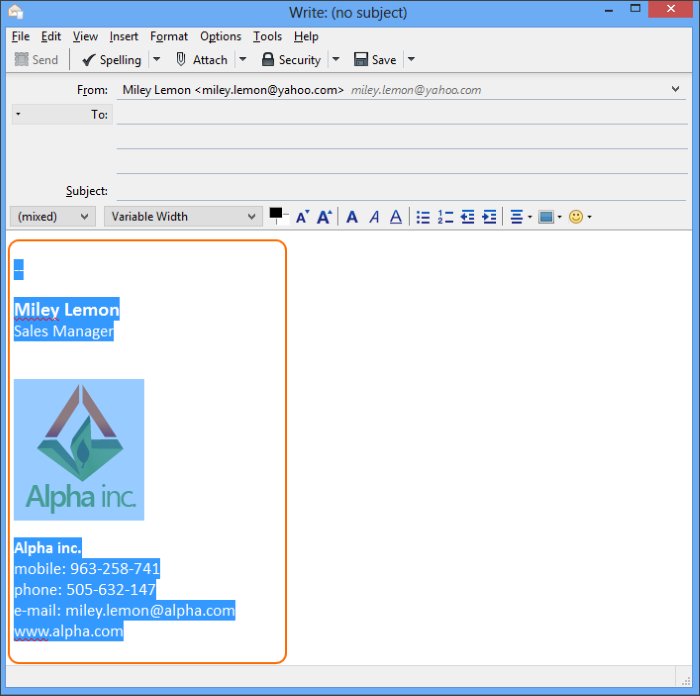 Type & paste you e-mail signature including images, if any. Resize the image as required. 4. Click on Insert menu on top horizontal menu tabs. 6. A message window will appear. 7. Click on insert at the bottom of message window. Copy the codes from the message window. 8. The signature banner appear at the bottom. The Signature banner will appear at composing e-mail window. Sure, just add social icons and link them to your Social media profiles. You can use our free signature generator to make this even easier. Thank you for your great help! I was able to follow your instructions, and get my siggy fixed asap! This is a very useful guide as I start a new business consulting service and am trying to do as much as possible on my own for now. Thank you for sharing your tools so others can be successful! Glad to know you find our guides and resources helpful! The easiest way for you to get familiar with the HTML code is to use our signature generator and export the signature to HTML. The HTML tags will point to an online image location, but you can try using the local images, the way you have seen in the third method.